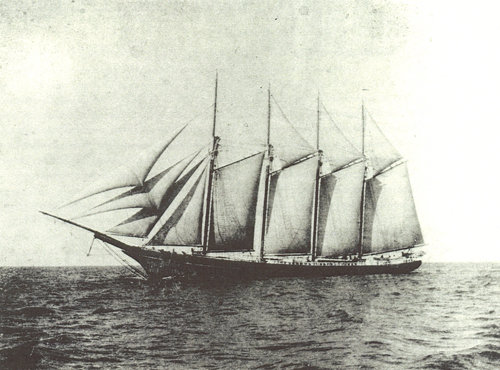 Built in 1896 in Camden, Maine, the Alma Holmes, named after the daughter of owner Joseph Holmes was a coal transporting schooner. On her fateful voyage, the Holmes had acquired a load of coal, departing from Norfolk, VA, destined for the Lehigh Coal Yards in Salem, MA. While just off Marblehead waters and in the vicinity of Halfway Rock, the Holmes encountered heavy fog. In limited visibility – about one boat length – the ship was literally sailing blind. She was struck broadside with little warning by the steamer Belfast. The Belfast smashed halfway through the Holmes on it’s starboard side and near the foremast (bow area). The Belfast wisely remained locked into the Holmes, for pulling back would have sunk the schooner all the more quickly. All of the Holmes’ crew was transferred to the Belfast and once the men were off the ship, the Belfast backed out and watched the Holmes slip beneath the waves. The Holmes sank in less than one minute. In 1993, the wreck of the Holmes was located by Ray Bates of Marblehead. Today the wreck sits upright and mostly a debris field with a skeletal hull shaping the remains. The depth is 160′ and there is little relief and many entanglements. Monofilament, netting, old lobster lines, etc create dangers for the wreck diver that must be carefully avoided. In the summer time, visibility ranges from about 10-15′ and very dark, making the wreck all the more challenging and potentially disorienting. Most opt to run a line into the sand while exploring the debris field. In the winter time, visibility can reach in excess of 40 feet. This is an excellent dive and an interesting wreck.